When you’re camping as a group, you could split up into two or three tents or you can get a tent that’s large enough for all of you. The second option often makes sense for families or just for groups who prefer to stick close to each other. Another vital tent buying consideration is the seasonal use you plan on. Some tents are only suitable for 1 or 2 seasons of the year. But many people want to go camping all year round. If you’re not someone who lets changes in the weather put you off camping, you need a 4 season tent that will offer you suitable shelter all year. We’ve reviewed bell tents from White Duck Outdoors before but never a cabin tent until now. If you’re looking for a large tent that’s suitable for all seasons, the White Duck Outdoors 4 Season Tent is one of the options that you should consider. After camping in this tent for a couple of nights we’d like to share our thoughts about who it’s suitable for and what’s good and what’s not. The tent is pretty straightforward to set up, which is always useful when you’re on a family camping trip. 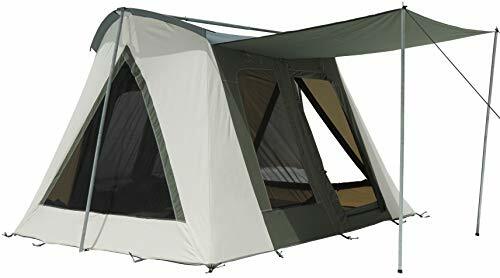 The frame design is very similar to that of the popular Kodiak Flex Bow and Springbar Highline canvas cabin tents. If you’ve put those up then this won’t be a problem. As with those models you can set the White Duck up on your own. However given the thicker cotton canvas of the White Duck the resulting increased weight makes it an easier task for 2. Once the main frame is up secure the tent to the floor with the supplied stakes and excellent, easy to replace shock cord loops. Once setup this 10×14′ tent is large. There’s plenty of space to move around and for storage of gear. On paper it’s a 6 person tent, but could sleep up to 8 if you’re willing to get really cozy. Personally we prefer a smaller group in a tent where we can enjoy lots of space. Ideally with room for a table, chairs, a heater to operate and for a decent sized cooler. One of the things that we really liked about this tent is that there’s a lot of options for storing your gear. There are O-rings all round the tent, for hanging your clothes and lanterns from, or perhaps for running a string of LED lights through. There are also pocket and roof organizers to make it easier to store your small items. In summer months the large outdoor awning can also create a storage area and shelter. This is useful for drying clothes or just for sitting under and enjoying the shade. As with similar canvas tent designs temperature control is a breeze with this tent. Firstly the thick 12oz cotton canvas roof is silver coated and reflects back much of the heat and harmful UV rays that try to enter the tent. This really does seem to work and we also liked the fact that the roof was darker than that of the Kodiak Flex Bow tents which for us let too much light in, especially in the morning. This particular camper likes it dark! The large windows and door can also be opened and closed and furthermore the mesh panels can be zipped up to block out the light. This allows maximum ventilation and helps maintain a pleasant ambient temperature. Generally we found that the tent is never too hot and never too cool. Though we only experienced light rain while sleeping out in the White Duck tent we’re confident this tent will perform if the wet stuff really comes down. The cotton canvas of the roof and walls is heavier than that of all the alternatives on the market. Furthermore it has been treated by the manufacturer with a ‘weightless water’, essentially a water repellent and mildew protection in one. The tent still retains the breathable properties of standard canvas. Firstly, we noticed that it’s particularly heavy and bulky when it’s packed up. Given this is a canvas tent this shouldn’t come as any great shock. This might not be a problem if you’re simply going to take it out of your car but it will still take up a lot of space, and you wouldn’t be able to carry it too far. Some minor issues are important to note too, such as the holding straps for the door, windows and canopy. These have hooks on them and can get snagged on your clothes, gear and other things when going in and out of the tent. Lastly while there is a fair amount of space, the walls are more sloped than on it’s nearest rivals. This reduces the headroom somewhat but to be fair makes the structure a little more stable. Given that the footprint is large anyway it doesn’t make the tent any less usable. It’s fair to say we really rate this tent from White Duck Outdoors. It takes everything that’s good about similar models from the market leading brands, think Springbar, Kodiac, Teton and makes what’s good, even better. Overall this decent sized tent is a great family option that you can use all year round. If you’re looking for a sturdy tent that you can use whenever you want and without too much trouble setting up, it’s perfect. It provides plenty of space for the whole family or for any larger group camping together, and there’s also room to store your essential gear be that for camping or hunting. The awning also offers a shaded outdoor space too. There are some small niggles, like the hooks that can snag around the door, but not enough that should put you off investing in this superb cotton canvas tent. ​VERDICT Canvas tents just got even better. Superb protection and ventilation. Almost perfect.